Neal Wade, a leading figure in Alabama's economic development efforts for the past two decades, will become the new chairman of the Public Affairs Research Council of Alabama (PARCA), the state's only nonpartisan research organization dedicated to the improvement of state and local government in Alabama. He succeeds former Alabama Gov. Albert Brewer, who was instrumental in creating PARCA and has served as chairman since PARCA's founding in 1988. Brewer will remain with PARCA as chairman emeritus. "It's an honor to welcome Neal as the new chairman of PARCA," said AT&T President Fred McCallum, who will be serving as this year's president of PARCA's board of directors. "Neal's vast experience in many significant public and private roles gives him a unique and deep understanding of the issues that face state and local government in Alabama." Jim Williams, PARCA's executive director, will continue in his role as head of PARCA's research, reporting and consulting efforts. Under the leadership of Brewer and Williams, PARCA has achieved recognition as the state's leading good-government think tank and is supported by a wide range of Alabama businesses, organizations and individuals. PARCA serves as an advisor to school systems, local governments and state agencies. A trusted source of objective information, PARCA issues regular reports on the financial and functional performance of government at all levels. Many governments and educational systems have adopted findings from PARCA studies and seen significant improvement in performance. "I look forward to being a part of the PARCA team as we expand the efforts to improve both government performance and the education of our most precious resource," said Wade, who will continue to work in economic development in Florida and in the four state Aerospace Alliance region. Wade also serves as chairman of the Aerospace Alliance which includes Louisiana, Mississippi, Alabama and Florida. "What an honor it is to follow in the giant footsteps of Gov. Brewer. My first job was working in his 1970 campaign and my last job in Alabama was at the Alabama Development Office, the state economic development agency his administration started," Wade said. In addition, Wade said, "In my economic development experience I have learned that good, effective government and an educated, trained workforce are vital to growing quality jobs. PARCA plays a significant support role in expanding Alabama's economy and the foundation it has laid over the past 25 years will serve this state for decades to come." 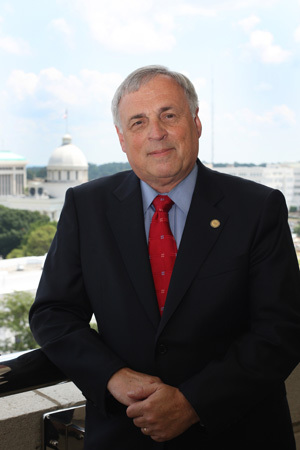 Wade, a native of Monroeville and a 1969 graduate of Samford University, is a member of Samford's board of overseers. He served as the first president of the Economic Development Partnership of Alabama from 1991 to 2000, and from 2003 to 2010 Wade headed the Alabama Development Office, now the Department of Commerce. Marci Edwards is PARCA's director of communications.